2019 is not off to a great start for Tesla. The federal tax credit U.S. customers receive for buying one of Tesla’s electric vehicles (EVs) dropped from $7,500 to $3,750 on Tuesday. To compensate, Tesla cut the price of all its vehicles by $2,000. While the move may please customers, shareholders are apparently less than thrilled: Tesla’s stock fell by more than 9 percent Wednesday morning — a sign that Tesla could be in for another tumultuous year. Based on the state of Tesla’s stock, one might think 2018 ended terribly for the company, but it actually had a solid fourth quarter. According to a press release, Tesla produced 86,555 EVs and delivered 90,700 in Q4 — an 8 percent increase over the company’s previous records in both categories. The issue is that, while these figures do show positive growth, investors were expecting more. The price cut is also an issue for investors, according to Craig Irwin, an analyst with Roth Capital Partners. 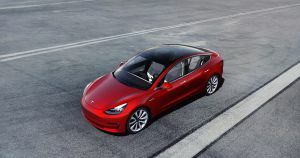 With it, Tesla confirmed that it relied at least partially on that $7,500 credit to encourage sales — and that’s not something investors want to hear. The post Tesla’s Stock Plummets After It Cuts Price of All Models appeared first on Futurism.